Super comfortable contemporary home shares with its visitors a breathtaking vista of the wide open wilderness across the street. 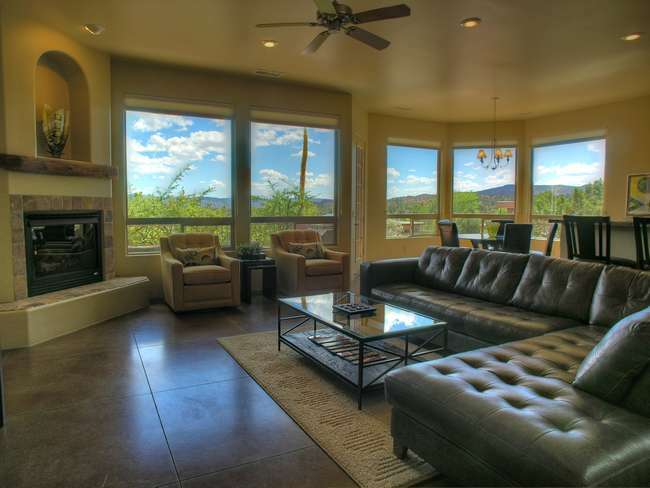 Enjoy a constantly changing canvas of high desert beauty all day long while relaxing in Sky Light's comfortable open concept living space. 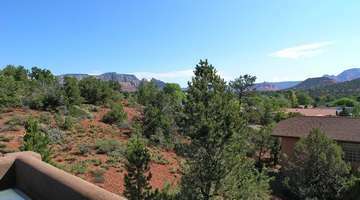 Comfortably appointed throughout, Sky Light’s bright contemporary style and super view provides a perfect place to return to after your days out exploring Sedona. You’ll be at home in this stylishly decorated abode. From the open concept living space and its fabulous green view, to the outdoor patio and three bedroom suites, Sky Light offers excellent accommodations for up to six. Whether you are a couple seeking a romantic getaway, a group of friends here to hike all wanting their own beds or a family of six, this home will provide everyone the space needed and the experience desired. 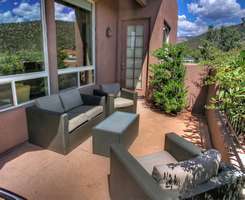 Let your Sedona experience begin at Sky Light!